While cocktails are still a major trend in the drinks market, whisky is also having a moment thanks to the revival of traditional production methods and artisanal liquors. Bourbon and Scotch are losing ground to rye and corn whiskies. But what’s the difference between all these different varieties? The clue’s in the name. This type of whiskey is made widely in the USA and must be distilled from at least 51 per cent rye. It stands out for its spicier and fruitier flavors than bourbon. Mid-19th-century American cocktails, such as the Old Fashioned and Whiskey Sours, were originally made with this kind of whiskey. In the US, sales of rye have jumped 6,000 per cent in five years, according to American authorities, confirming the comeback of this traditional tipple. The Beast Smoke House in Paris suggests its “The Beast Old Fashioned” cocktail with 4cl of Sazerac Rye, 2cl of Sweet Vermouth, a dash of Angostura bitters and a dash of Bitter End BBQ Bitters. With fewer corn whiskeys on the market, novice tasters will have less trouble choosing this kind of liquor. As the name suggests, this whiskey is distilled from at least 80 per cent corn. It offers more rustic flavors than rye or bourbon. After falling out of fashion and out of general consumption, a corn whiskey revival is currently underway, driven by renewed taste for cocktails based on traditional whiskeys. The trend is sure to bring success to producers since only three brands currently make this kind of liquor, in Kentucky and Missouri, USA. Whiskey is liquor produced by the fermentation and distillation of grains. Bourbon must be distilled from at least 51 per cent corn, topped up with malted barley, wheat and rye. If distilleries opt for wheat, then the bourbon is said to be “wheated.” The drink is then aged in oak barrels. Bourbons are often produced in Kentucky, where they originated. Bourbon is the traditional rival for Scotch in the world of whiskey. First of all, Scotch isn’t a whiskey but a “whisky” without the “e,” which takes its name from its place of origin, Scotland. 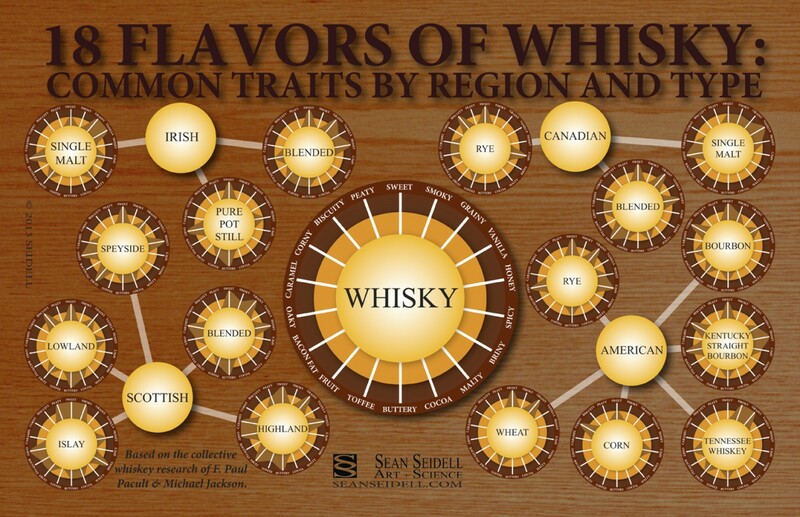 Note that only whiskey from the USA and Ireland uses the “ey” spelling, drinks with other origins are labelled “whisky.” Scotch is primarily made from water and malted grain, traditionally barley, at a distillery in Scotland. The fermented mash can include other whole grains. Scotch has to age for at least three years in oak barrels and must have a minimum alcoholic strength by volume of 40 per cent (80 US proof).